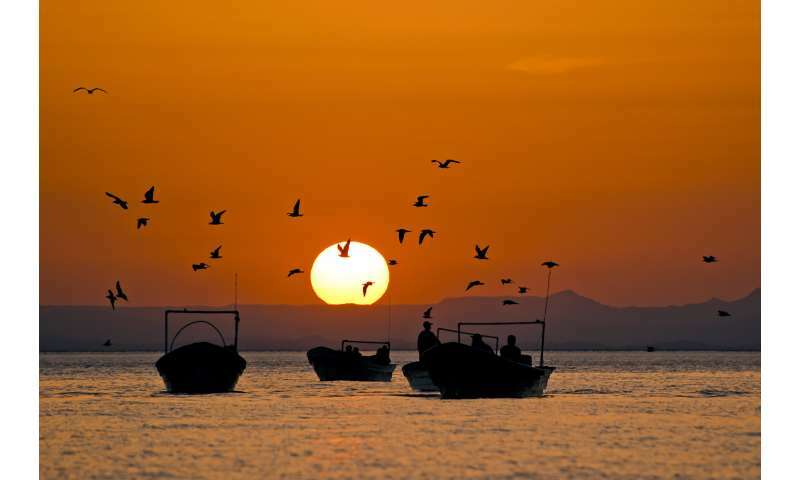 A new study suggests that more small-scale fishing boats are operating in the Gulf of California than is economically and ecologically sustainable, suggesting that local fishermen are spending more time and money to catch fewer fish. Scientists at Scripps Institution of Oceanography at the University of California San Diego used images from satellites and flyovers to count the number of small boats, or pangas, to find that fishing in Gulf of California, which separates Baja California and mainland Mexico, is over capacity. The analysis suggests that future investment in the region's fisheries may not be economically or ecologically viable. The study, published on April 12 issue in the journal PLOS ONE, estimated that 34 percent more small-scale boats were operating at any given moment in the gulf during a three-year period (2006-2009). According to the analysis, 17,839 boats were operating in an area that can only sustain 13,277 boats to maximize the benefits of catching more fish per trip. "The current overcapacity of boats means that fishermen are working harder to catch fewer fish," said Andrew F. Johnson, a postdoctoral scholar in the Gulf of California Marine Program at Scripps and lead author of the study. The researchers developed a new method that calculates predicted fishing effort, to predict where and how many small-scale fishing boats operate in the gulf. They compared the results to commercial fishery landings throughout the region to show that there are more small-scale fishing boats operating in the area than the predicted amount required to land the same amount of fish. This new finding, the researchers say, is taking a heavy toll on a region that supplies nearly 75 percent of Mexico's fish and is a popular spot for recreational sportfishing, diving, and other ocean activities. Even more so when recent more recent estimates of boat numbers suggest effort in the region could now be at double overcapacity. "This long-term overfishing reduces the biological capacity of reefs, mangroves and other important fish habitats," said Octavio Aburto-Oropeza, and senior author of the study. "Ultimately, this means we are reducing the future economic and ecological productivity of the gulf." Understanding overcapacity is important because it can help fishing communities and management better gauge their economic status and manage their environmental impact, the researchers noted.